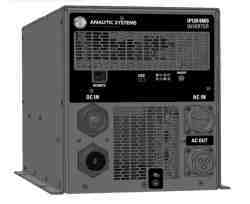 2400 Watt Heavy industry and military grade pure sine wave DC/AC inverters, 28VDC, 48VDC and 125VDC, 115VAC and 220VAC Versions, C.O.T.S. Pure sine wave precisely duplicates household AC voltage. Suitable for any computer that requires less than 2400 watts continuous. Very rugged and reliable, conformal coated. 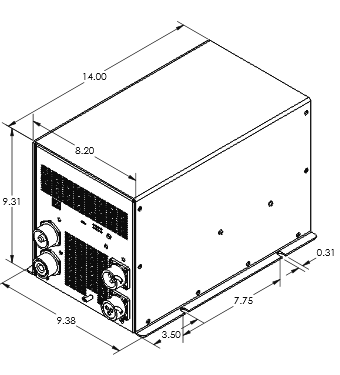 Suitable for operation with lead acid, sealed lead acid, lithium ion and lithium iron phosphate batteries. Thermostatically controlled fan comes on when needed. Using the free to download 'Power Wizard' software, the user can select output frequency, output voltage and low voltage shutdown parameters from any laptop through the standard USB interface.